CANBERRA, Australia — Australia's prime minister on Monday described his government as stronger on national security than the opposition after signing an agreement with the French government to deliver a fleet of submarines and ahead of federal elections expected to be held in May. 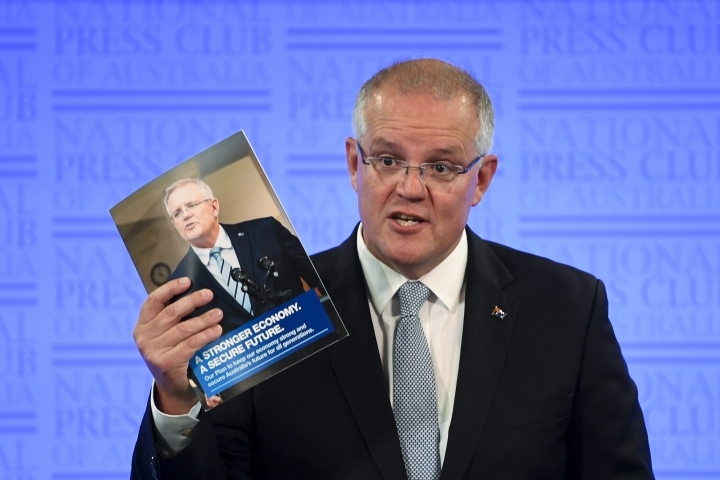 Prime Minister Scott Morrison used a speech to Australia's National Press Club on the eve of Parliament's first sitting day of the year to detail his conservative coalition's record on a diverse range of security issues including military spending, stripping extremists of Australian citizenship, asylum seekers, contentious laws to prevent criminals from using encrypted communications, and domestic violence. Earlier, Morrison and French Defense Minister Florence Parly signed a new agreement to deliver the first of a fleet of 12 submarines to Australia in the early 2030s. French state majority-owned shipbuilder DCNS won the 56 billion Australian dollar ($40 billion) contract in 2016 to build the world's largest diesel-electric submarines. The partnering agreement was reached after months of heated negotiation. The agreement spells out details such as warranties for defects and how much Australia must pay if it cancels the contract. U.S. defense company Lockheed Martin Corp. has been contracted to design and fit the submarines' weapon systems. Parly hit out at critics of how long the negotiations had taken. "When I heard at some point ... whining about the length of negotiations, I thought: 'open your eyes. This is the deal of the century. This is a partnership for the century,'" Parly said. Morrison said his government was on track to boost defense spending to 2 percent of gross domestic product — a level demanded by President Donald Trump of U.S. allies — by 2020-21. When the center-left opposition Labor Party was last in office from 2007 to 2013, defense spending fell to 1.56 percent of GDP — Australia's lowest level since 1938. "Our government has demonstrated that we have the mettle to make the right calls on our nation's security," Morrison said. He said Labor's strength on border security could be tested this week when the opposition considers changing laws to allow doctors rather than bureaucrats to decide which asylum seekers held in Pacific island camps on Nauru and Papua New Guinea can fly to Australia for medical treatment. The conservative government has all but stopped asylum seekers from Asia, Africa and the Middle East coming by boat from Southeast Asian ports by insisting that no boat arrivals will ever be allowed to settle in Australia. The asylum seekers are banished to island camps where they face uncertain futures. But those allowed into Australia for hospital treatment typically get court injunctions that prevent their return to the islands. The government argues that if the law were changed, more than 1,000 asylum seekers, mostly males, would come to Australia from the islands within weeks, which would encourage thousands of new asylum seekers to head to Australia by boat from Indonesia. The change to legislation on medical evacuations was passed by the Senate with Labor's support in December. Morrison's government has lost its majority in the House of Representatives, where the change could become law as early as Tuesday. Morrison ruled out reaching any compromise with Labor on the change. "I know what compromise and poorly thought through changes can do to the borders," Morrison said. Eli Shakiba, an Iranian refugee on Nauru who will soon start a new life in the United States, urged lawmakers to change the system in which medical evacuation decisions are often argued in court. Shakiba is relocating after five years on Nauru under a 2016 bilateral deal for the United States to resettle up to 1,250 refugees rejected by Australia. "Please, I would like to ask you: Will you vote for this bill tomorrow in Parliament to bring sick people to Australia for treatment, or more of us will die here because of the Australian government ignoring doctors?" she told Australian Broadcasting Corp. in an appeal to lawmakers. Twelve asylum seekers have died on Nauru in the past five years. Senior opposition lawmaker Mark Dreyfus said Labor had decided late Monday to negotiate with independent lawmakers to amend the bill it had passed in the Senate to ensure the government has discretion to refuse medical transfers on security grounds. If the independents accept Labor's amendments, the government would become the first in 90 years to have a law passed against its wishes. Some in Labor fear the change would be perceived as a weakening of border security and result in a repeat of the 2001 election, in which a tough policy against asylum seekers helped the conservatives retain power. The conservatives were behind Labor in opinion polls in 2001 before Norwegian freighter MV Tampa rescued 433 Afghan asylum seekers from a sinking Indonesian fishing boat and attempted to deliver them to the nearest port, Australia's Christmas Island. Australia sent soldiers to stop the ship, which was diverted with its human cargo to Nauru under a new refugee policy. The conservative government was re-elected weeks later after a campaign that focused on a tough stance on asylum seekers.